Balzer + Bray, 9780061992728, 288pp. Thirteen-year-old Lamar Washington is the maddest, baddest, most spectacular bowler at Striker's Bowling Paradise. But while Lamar's a whiz at rolling strikes, he always strikes out with girls. And his brother, Xavier the Basketball Savior, is no help. Xavier earns trophy after trophy on the basketball court and soaks up Dad's attention, leaving no room for Lamar's problems. Until bad boy Billy Jenks convinces Lamar that hustling at the alley will help him win his dream girl, plus earn him enough money to buy an expensive pro ball and impress celebrity bowler Bubba Sanders. But when Billy's scheme goes awry, Lamar ends up ruining his brother's shot at college and every relationship in his life. Can Lamar figure out how to mend his broken ties, no matter what the cost? From debut author Crystal Allen comes an unforgettable story of one boy's struggle to win his family's respect and get the girl of his dreams while playing the sport he loves. 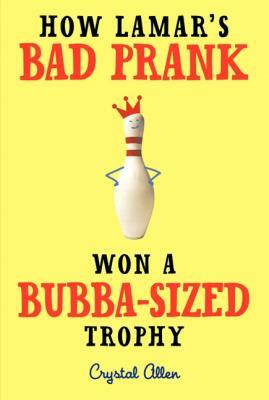 Crystal Allen is the author of How Lamar's Bad Prank Won a Bubba-Sized Trophy, which received a Florida Sunshine State Award Master List nomination and was a Junior Library Guild selection. She is also the author of the acclaimed middle grade novels The Laura Line, The Magnificent Mya Tibbs: Spirit Week Showdown, and The Magnificent Mya Tibbs: The Wall of Fame Game. She currently lives in Sugar Land, Texas, with her husband, Reggie, and two sons, Phillip and Joshua. You can visit her website at www.crystalallenbooks.com. Under all the braggadocio is a boy with a big heart, and from the first sentence Lamar will have readers hooked.